The famous Malba Womans Clubhouse is available for special events, functions and meetings. Contact us here so that we can discuss your needs. The land on which the Woman's Club stands today was obtained May 10, 1909 from the Malba Land Company. The building was completed in 1910 by Robert M. Catts as a dwelling. It was later used as the clubhouse for the golf course. At the end of WW II only 13 houses stood in the neighborhood known as Malba. On December 6, 1917, an agreement was made between the Malba Estates Corp. and the Malba Association in regard to the house. The Malba Field & Marine Club owned the property for a while. In 1932, they sold it to a private individual from whom the Malba Woman's Club rented it from 1933-1941. At that time, the members of the Woman's Club acquired the house through foreclosure and paid $2,000 to satisfy the tax lien on the dwelling. All the women made loans to the Club in order to buy the house, and all were later repaid. On November 24, 1933, the Woman's Club of Malba was incorporated in the State of New York. It was a time of great formality as the minutes from the 1930's show that all the women were referred to as "Mrs." and not by their first names. Many social activities took place in the Clubhouse. They had Bridge games, teas, parties and dances. The house was the hub of the social scene. nutrition, medicine, the environment, arts and crafts flower arranging and make up design and exercise classes. There have been pancake breakfasts, flea markets and, of course, the annual Rummage Sale. Other fund raisers were the Fashion Show luncheons which became the Fashion Show dinners and trips to museums, Designer Showcase Shows, Radio City Music Hall, dinner theaters and Atlantic City. On May 11, 1993 The Woman's Club along with the Garden Club and The Field & Marine Club presented a night with Juilliard students. Audra McDonald, who later became a Tony Award winner, was the soprano that night. She has starred in Carousel, Ragtime and Master Class. All the proceeds from fund raisers and rentals are used towards the maintenance and renovation of the club house. In 1985 the house was in jeopardy of being sold due to an immense tax burden because the city decided to classify it in the commercial tax bracket. Once more the ladies came to the rescue with emergency funding, appeals to the Tax Commissioner and to local politicians. Eventually, the taxes were reduced and the historic house remained with the women. This house is only one of two houses that are left on Long Island which are still owned by Woman's Clubs. 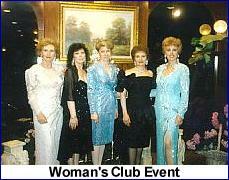 The Woman's Club has an executive board of twelve members and annual dues of $50. The current president is Mrs. Elaine Manhart 767-0731. Every female resident of Malba is invited to join. The Woman's Club mission is: "To serve and provide for the mutual assistance and improvement of the members of the community of Malba and its vicinity through charitable, cultural and education activities, programs and events. The club meets monthly on the second Tuesday of each month at 12:30 p. m. at the Club House: 30 Center Drive. One or two months of the year are set aside for evening meetings to accommodate the working members.